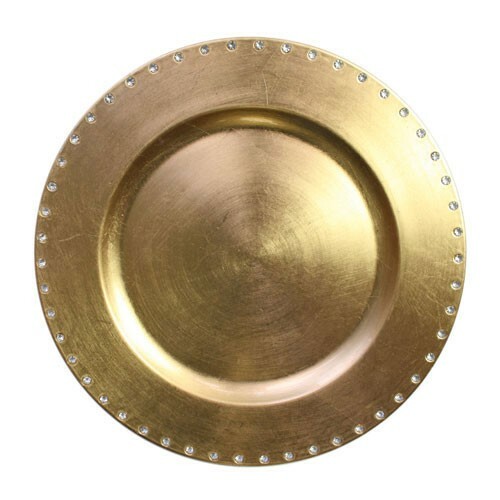 ChargeIt by Jay Gold Jewels Rim Charger Plate 13"
Home > Products > ChargeIt by Jay Gold Jewels Rim Charger Plate 13"
A perfect backdrop for your dinnerware pieces, the ChargeIt by Jay Round Gold Jewels Rim Charger Plate 13" will enhance your table setting. Designed with rhinestones and a jeweled rim, this attractive charger plate is elegant enough to beautifully complement the dining decor at all types of special occasions. An excellent option for upscale gatherings, this charger plate is a great addition to your restaurant, hotel and other food service establishments. Thanks to its sturdy polypropylene construction, it will keep up with heavy use and last for years. This charger plate is not intended for dishwasher use.